What percentage of men and women have tattoos? The answer may surprise you. Women way outnumber the men. In fact 59% of women over the age of 18 in the U.S. have at least one tattoo. 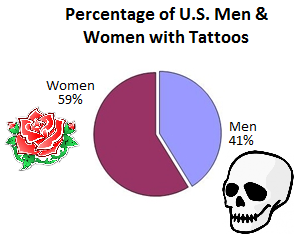 In comparison, only 41% of men have a tattoo. That statistic almost seems counterintuitive because we tend to notice tattoos on men more than women. This is probably due to the size of the tattoos. Men tend to get large pieces and sleeves whereas women get smaller tattoos and put them in discrete areas easily covered by clothing. Of course there are exceptions and I’ve seen variations to this rule on both sides. For the most part my practice seems to reflect the national patient population. The majority are women with small tattoos in hidden places. My male patients generally have large artwork. Female patients are often trying “to move on” and many of the male patients want to fade a piece to make room for something else. Regardless of which category you may or may not fit into, I can help. If you have a large tattoo in a conspicuous place or something small and hidden you wish to remove, I can be reached by phone @ 512-479-9997 or just stop by my NEW location in Austin, TX: Austin Medspa on W. 6th St.